The RCK-403 4U Rackmount Chassis pro-vides a cost effective solution for a variety of industrial applications. The RCK-403 can support up to two 3.5" HDD drives with Mo-bile Rack and a slim optical drive, retaining bar is included to hold expansion cards in place for those applications which encounter a high level of vibration. 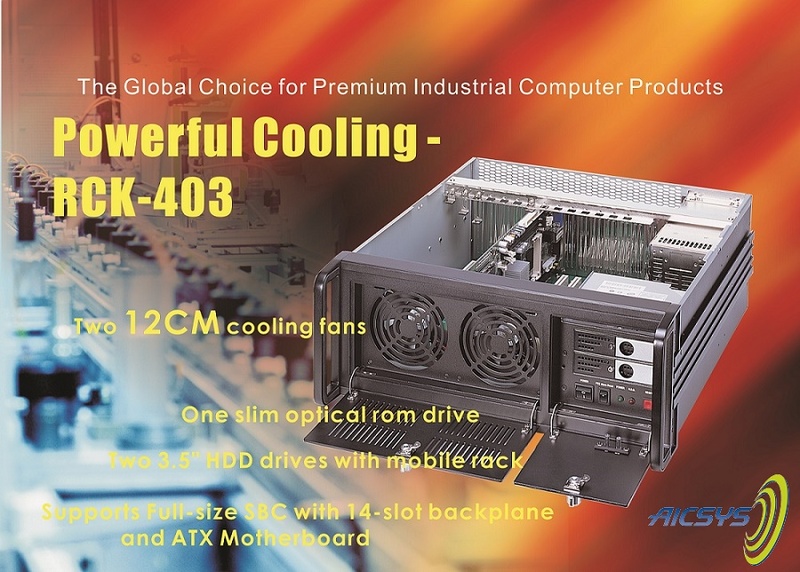 The chassis has 2 extra large fans for optimum cooling. Both AT and ATX PS/2 size Power Supplies and Mini-Redundant power supply are supported by the RCK-403 for any applications with unique power requirements. The RCK-403B supports 14-slot backplane for full-size PICMG SBC (Single Board Computer) and ATX motherboard.